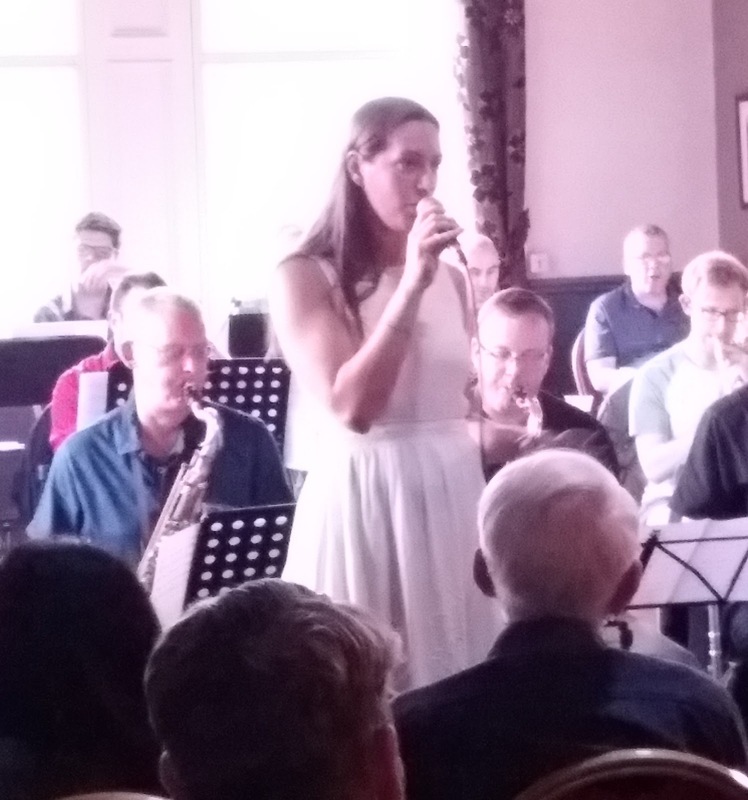 Last Thursday in the month down at the Millstone public house it’s the Strictly Smokin’ Big Band’s public rehearsal night. May’s session featured no fewer than six deps across all sections. It didn’t make a jot of difference with the band on form from the off and, what’s more, some thirty minutes before the downbeat all seats in the upstairs function room were occupied. It was a warm, humid evening yet the windows remained closed, perhaps to comply with licensing restrictions on noise levels. So, the band hit the ground running with Alice Grace singing That Old Black Magic. That is reason enough to get along to the band’s rehearsal session – fantastic! Ja-Da with Michael Lamb leading the way with some blistering trumpet playing before the fabulous Alice Grace returned to confess You Make Me Feel So Young. Tyneside and the wider north east region boasts many fine singers, Ms Grace is right up there with the best of them and nothing but nothing could match her take on a Songs for Swingin’ Lovers’ masterpiece. How D’Ya Like Your Eggs in the Morning? enquired F’reez of Alice, Alice, in turn, asking the same of F’reez. All good fun! A tremendous, lazily slow, arrangement of Bobby Hebb’s Sunny featured a soulful F’reez at his best. MD Lamb raided Dave Slonaker’s big band pad for something just a little more contemporary, choosing Point of Departure from the American’s Grammy-nominated Intrada album. A Bob Mintzer chart – ‘a Spanish thing’ said Lamb – maintained the contemporary feel with a bona fide American, trumpeter Pete Tanton, wearing a brightly coloured Hawaiian shirt, sharing the honours with tenor man Paul Gowland. The interval; a rush to the downstairs’ bar, another pint of Workie Ticket and a nicely chilled Pinot. Right on cue Brian and Jimmy walked through the door. Never on time for the first set, but always in time for the second, they joined the queue at the bar. A swinging Sweet Georgia Brown resumed matters, a contemporary piece with the band clapping as one opened and closed the unnamed piece (note to self…ask MD Michael Lamb about the title) and Quincy Jones’ Jessica’s Day mixed it up, keeping the orchestra on its toes. The deps were on top of matters, no question about it: Elliott Todd bolstered the trumpet section, Tom Dowling made a return to the ’bones, Niall Armstrong wielded baritone in Laurie Rangecroft’s absence, Ben Helm subbed for Pav on guitar, and the man at the back, bassist Paul Grainger, didn’t miss a trick. That leaves Dave Kerridge. Up from Teesside, DK is little heard on Tyneside yet when he does turn up he certainly makes a big impression. Alice Grace returned to sing Don’t Think Twice, It’s All Right. It was a more than an alright evening down at the Millstone.